The Exadata Smart Flash Cache provides the capability to stage active database objects in flash. The Exadata Smart Flash Logging speeds up the critical function of database logging. Write-back flash cache, which is used for improving write-intensive operations because writing to flash cache is faster than writing to hard disks, is useful in running heavy jobs against a database. According to Oracle, depending on application, write performance might be up to 20 times faster to disk (measured in input/output operations per second (IOPS)) and have 10 times more write IOPS than to disk. The cell attribute flashCacheMode determines the cache mode. The possible values are: “WriteThrough” and “WriteBack”. Write-back flash cache improves write-intensive operations because writing to flash cache is much faster than writing to hard disks. Write-back flash cache transparently accelerates reads and writes for all workloads for on-line transaction processing (OLTP) (faster random reads and writes) and for data warehouses (DW) (faster sequential smart scans). 1) Significant wait times for "free buffer waits"
2) High I/O times when checking for write bottlenecks in Automated Workload Repository (AWR) reports. 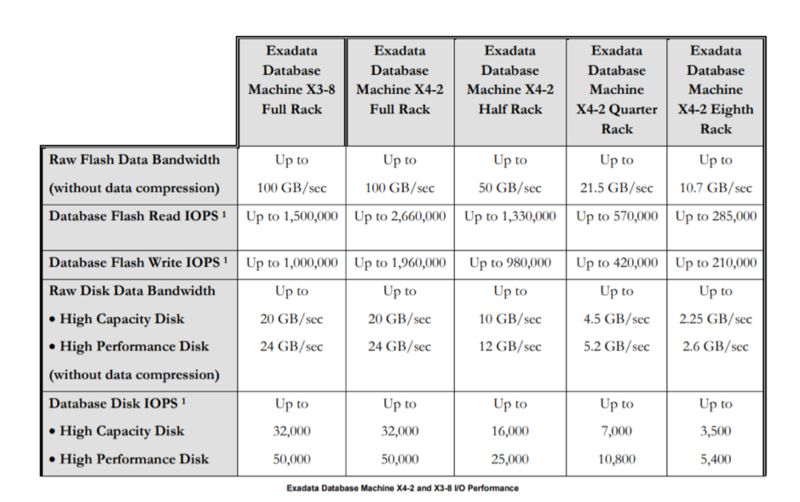 The following table shows the performance that the Exadata Smart Flash Cache provides at the database level for the various Exadata X4 configurations. Smart Flash cache understands different types of database I/O. Frequently accessed data & index blocks are cached. Controlfile reads and writes are cached. File Header reads & writes are cached. The Database administrator can influence caching priorities. Unfortunately, there is no easy way to monitor what’s in the cache. Oracle has provided a list flashcachecontent command in the cellcli tool, but it offers no summation options and displays only object numbers. The Exadata Smart Flash Cache is a cache on the cell (storage) server for storing redo-data until this data can be safely written to disk. The Exadata storage server comes with a substantial amount of flash storage. A small amount is allocated for database logging, and the remainder is used for caching user data. On a full-rack exadata server, the 5 TB of flash cache can store a significant amount of data. – Users can provide optional hints to influence caching priorities. - Administrators can disable smart flash cache for specific databases. Two key features of the Exadata Storage Server Software leverage the Exadata Flash hardware and make the Exadata database machine such a fast system on which to deploy an Oracle Database. First, the Exadata Smart Flash Cache provides the capability to stage active database objects in flash. Second, Exadata Smart Flash Logging speeds up the critical function of database logging. Deploying an Oracle database requires mission critical resilience. Using Exadata Storage Server software in conjunction with the Oracle database provides that resilience. The biggest advantage of Flash Cache configuration is that it can be done while the system is online and servicing I/O requests. Rolling Method – This method assumes that relational database management systems (RDBMS) and automatic storage management (ASM) instances are up and are enabling write-back flash cache in only one cell server at a time. Non-Rolling Method – This method assumes that RDBMS & ASM instances are down while enabling write-back flash cache. Use the write-back flash cache feature to leverage the Exadata Flash hardware and to make the Exadata database machine a faster system for Oracle database deployments. 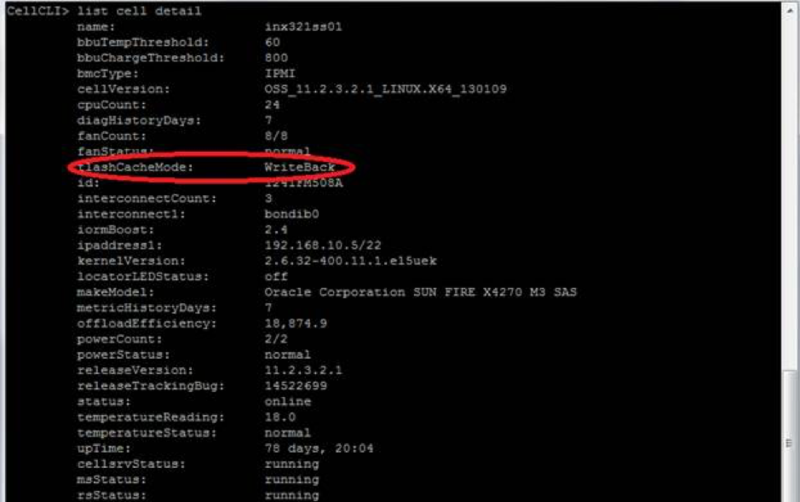 Flash storage inside the Oracle Exadata database machine is used completely as flash cache by default. This enables it to work effectively as an extension of the database buffer cache and to deliver faster access, including a very high IOPS rate, which is especially important for OLTP. Additionally, you can take a part of the Flash Storage to build ASM diskgroups upon it. Files placed on these diskgroups will reside permanently on flash storage with no caching needed. If you have any questions on the topic, feel free to leave a comment in the field below.